Working long hours and want to go home with a happy, relaxed Dog? Let your pet burn off some energy and make new friends at Pet Nation Lodge Dog Daycare! Working long hours and want to go home with a happy, relaxed dog? 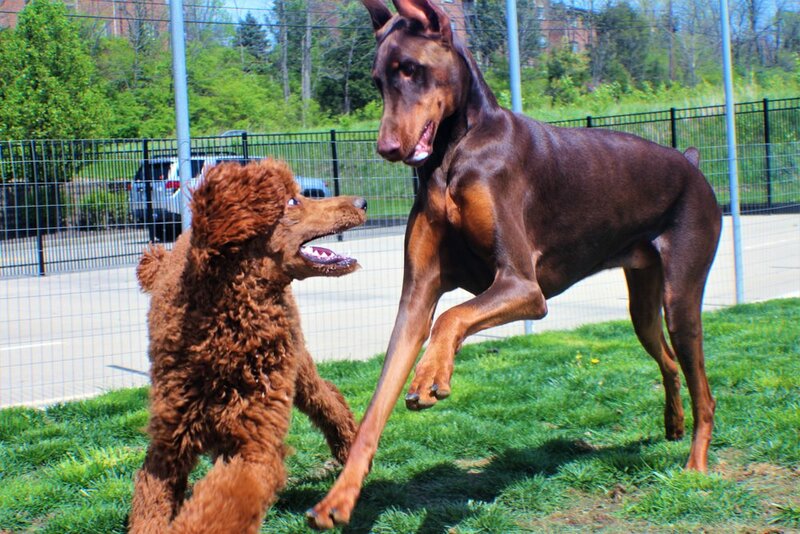 Let your best friend burn off some energy and make new friends at Pet Nation Lodge's Daycare Facility! If your dog is restless, lonely, or just plain bored; quality daycare is a wonderful solution. Pet Nation Lodge is a safe and inviting place for dogs to get that extra affection and stimulation they need. In addition to that, our team is practiced at accommodating a wide spectrum of animal dispositions. We understand that every dog is unique in their own special way, so we create a specialized environment that will best suit your pet's needs. Here at Pet Nation Lodge we believe that it isn't healthy for a large numbers of canines to gather together for extended periods of time with no structured rest periods. Our groups are rarely over 12 dogs. What makes us so unique is that we match dogs with similar temperaments, age, and sizes. Then, once placed in a group, we rotate them throughout the day making sure each and every dog gets the most amount of playtime as they can. After an ample amount of play time, our daycare guests get their own private suite for rest time. Not enough rest can be dangerous for canines as it lowers their immune system. A good rest interspersed with active play results in a perfectly relaxed pet. Gives you peace of mind knowing that your pet is in a safe, fun place! Hesitant about bringing your dog in for Daycare or Boarding out of fear of how well they'll interact with other dogs or how those other dogs will interact with them. Well, the solution is to simply, stop by the Lodge, at any time, and we'll evaluate your dog through the use of our Trial Day. We use these trial days not only to evaluate how well your dog will assimilate to our environment but it also gives us a chance to see: how social your dog is, what kind of temperament they have, and how they will connect with their fellow fur buddies. We accomplish this utilizing a controlled environment where the trial dog is introduced to a variety of stimuli individually, and not all at once. By doing this we can achieve a much more in-depth understanding of your dog's norms and social behavior allowing us to place them in a group that is the safest and most engaging. When the trial day is finished we'll provide you with the information that was gathered throughout the day and let you know how your dog did. - Membership covers UNLIMITED use of the Doggy Daycare program at PET NATION LODGE. - The membership covers both Full Day Daycare (5+ hours) or Half Day Daycare (up to 5 hours). IF YOU HAVE ANY ADDITIONAL QUESTIONS REGARDING Daycare OR OUR TRIAL DAY PLEASE LET US KNOW BY FILLING OUT THE FORM BELOW.